John (Red) Pollard may have ridden one of the most famous race horses in history, but his life was anything but glamorous and easy. Pollard was born in 1909 in Edmonton, Alberta, and lived in affluence until 1915 when the family business, a brickyard, was destroyed in a massive flood. Within seconds the family fortune went from riches to rags. However, while the money was gone, perhaps misfortune was what found the 5’6” Pollard seeking a job as a jockey at the age of 15 instead of working in the family business. Montana was his first port of call, and he apprenticed and travelled to the tracks and fairs in the western states and provinces. It wasn’t until 1926 that he had his first win. Pollard’s racing career wasn’t going to make headlines, but one day he was introduced to a group who would change his fortune and his life forever. “Silent” Tom Smith, an almost legendary horse breaker worked for wealthy automobile entrepreneur Charles S. Howard, and the horse who was part of this odd trio was Seabiscuit. Born May 23, 1933, he was small, knobby kneed, loved sleeping and eating and didn’t care much for the effort of racing. However, he had some illustrious blood running in his veins; he was sired by Hard Tack, a son of the mighty Man o’ War. 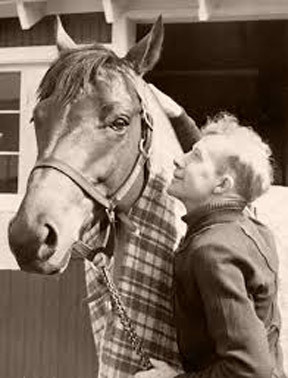 Seabiscuit’s original trainer Sunny Jim Fitzsimmons thought that the horse had potential but was lazy so the horse was relegated to a tough schedule of smaller races. Even this didn’t work and he placed in the back of the field in 17 races. Eventually the horse became the brunt of the barn jokes, and things kept getting worse. As a two year old he ran 35 races winning five times and finishing second seven times, but nobody wanted him even after some claiming races. In the summer of 1936, Tom Smith took note of the little horse, and decided he liked what he saw. The horse was purchased for Charles S. Howard for $8000 and Smith paired the lethargic horse with Pollard who encouraged horses to do their best without the using the whip and aggression. Who knows what Pollard’s riding style and Smith’s training did, but the horse began to win prestigious races on the east coast, and he didn’t speed away from the gate, but liked to pace himself, stay with the pack, and then pull ahead with a dash of late speed. 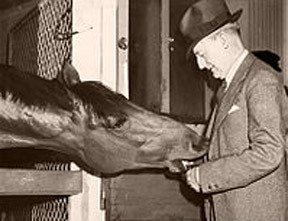 Seabiscuit and owner Charles Howard. At the end of November Seabiscuit was shipped to the west coast by rail, and won the Bay Bridge Handicap by five lengths. At the World’s Fair Handicap, the little horse led from start to finish. Seabiscuit made a mockery of the warm up race for the Santa Anita handicap and won. In the next race, he was bumped at the start and came in fifth to a horse named Rosemont. The Santa Anita Handicap, worth $125,000 back in 1937, was known as, “The Hundred Grander,” and was considered the big race to win out west. But fate was once again unkind to the group as jockey error saw Rosemont win by a nose. It was then that Howard, and Smith found out that Pollard was blind in one eye, and he had not seen Rosemont approaching close over his shoulder. The blindness was something that Pollard had sustained in a training accident and had managed to keep secret. In 1938 Pollard and Seabiscuit kept on winning, but lady luck was about to pull the rug out from under Pollard’s feet. He was in a terrible fall while racing another of Howard’s horses named Fair Knightess, and his chest was crushed by the horse, and his arm and ribs were also broken. Four months later, Pollard felt ready to ride again, and as Seabiscuit was being ridden by jockey George Woolf, Pollard began working with a young colt. The youngster spooked, dashed through the stables, and Pollard’s leg was smashed. His racing career was in serious jeopardy. During his hospital stay at Boston’s Winthrop Hospital, he met nurse Agnes Conlon, and she helped him get better during his initial recovery. His leg had to be reset to ensure it healed correctly, and Pollard, wearing a brace began to walk, then trot, and finally canter Seabiscuit who had himself suffered a ruptured suspensory ligament in the front left leg. Eventually the horse was back in full training, and Pollard had convinced Howard to let him race the horse again. They placed third in La Jolla Handicap at Santa Anita in 1940 and then in their third race, they were back on form, and won the San Antonio Handicap by two and a half lengths. Next up was the big one; the $121,000 Santa Anita Handicap, and 78,000 spectators arrived to see two of the best horses challenge each other: Seabiscuit and Kayak II. But it wasn’t a foregone conclusion even though most people put their money on Seabiscuit who was blocked right from the start of the race. The horse and jockey rallied and led briefly. Then as they came down the back stretch, Seabiscuit was again blocked in third place. However, Pollard knew his horse, and knew that late acceleration was his strongpoint. The pair stormed past the leaders, found firm ground just off the rail, and took the race by a length and a half from Kayak II. Seabiscuit retired in 1940, and went to Ridgewood Ranch in California. At that time he was horse racing’s all-time leading money earner with lifetime earnings of $437,730. Pollard had another serious fall in 1945, and afterwards gave training a try, but preferred riding. He retired in 1955, and could boast 18 wins to his credit. He and Agnes had two children and called Pawtucket, Rhode Island home until his death in 1981. She died two weeks later. Pollard had just a grade four education, but he always travelled with pocket books of Shakespeare, Omar Khayyam’s, Rubaiyat and Robert Service’s, Songs Of The Sourdough. When he was in the hospital, he read poetry to Agnes during their courtship, something he continued with his children after dinner in later years. Pollard’s daughter Norah Christianson said that her father was, “a loner, a desperado, an extreme free spirit.” Before he retired, he would get up at 4:30am, go to the track to work horses, and then return with some of his racing pals to eat breakfast, and talk horses and racing. The track and racing was his life, and belonging to clubs, groups and organizations was not something he enjoyed. That however would change in 1940 when he was asked to be on the first Board of Directors of the newly created Jockey’s Guild established to help injured jockeys, establish insurance, create better racing environments and monitor legislation about racing. Laura Hillenbrand’s 2001 book, Seabiscuit: An American Legend, and the 2003 movie Seabiscuit, nominated for an Academy Award for best picture, served to showcase this heart warming tale. During the great depression, America found the dream it needed to cling to in an odd combination of a partially blind, injured, oversized jockey; a trainer with an almost mystical connection to horses; an owner who thought the day of the horse was over; and an oddly put together little horse that needed gentle encouragement to do his job. Surely, the stuff of dreams and great stories! Amo esa historia, todos resurgido como el ave Fénix, que personajes y que animal tan Admirablemente!!! Tuti: Gracias por los amables comentarios. Me alegra que haya disfrutado de la historia de estos interesantes personas y el famoso caballo! When I was feeling down and out one time I bought the movie Seabiscuit. This story lifted me out of my doldrums and as they say get back in the saddle and I did. What a uplifting and inspiring true life story. THANK YOU LAURA Hillenbrand. And thank you Seabiscuit and all involved in your life. Hello! Great article. I am in the writing phase of a documentary about the Seabiscuit Legacy. I’m wondering if you can tell me your source for that photograph of Pollard and Seabiscuit. I’d love to be able to use it. John: I sent you an email with some info. Cheers and good luck with the documentary.